Der Bettelstudent/The Beggar Student (Jacob Fleck and Luise Fleck, 1927) is a silent film operetta, a popular genre of the Weimar cinema. It is an adaptation of Carl Millöcker's popular operetta The Beggar Student, but without the music. The cast is lead by Harry Liedtke, Agnes Esterhazy and Maria Paudler. German postcard by Ross Verlag, Berlin, no. 91/1. Photo: Aafa. 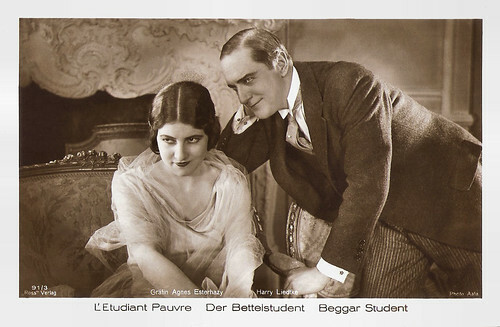 Publicity still for Der Bettelstudent/The Beggar Student (Jacob Fleck, Luise Fleck, 1927) with Agnes Esterhazy and Harry Liedtke. German postcard by Ross Verlag, Berlin, no. 91/2. Photo: Aafa. Publicity still for Der Bettelstudent/The Beggar Student (Jacob & Luise Fleck, 1927) with Maria Paudler and Agnes Esterhazy. I've never seen this film version of Der Bettelstudent/The Beggar Student, but the publicity photos on this series of Ross Verlag postcards are enticing. 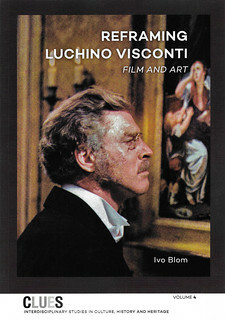 The film's sets were done by Botho Hoefer and Hans Minzloff under the art direction of Rudolf Walther-Fein and the camera work was done by Edoardo Lamberti and Guido Seeber. All five did an elegant job. The cast is also promising. Harry Liedtke plays the lead as Simon the beggar student, and his leading ladies are the beautiful Agnes Esterhazy as countess Laura and Maria Paudler as her sister Bronislawa. Furthermore there is Ida Wüst as Gräfin Nowalska, the mother of the girls, Ernö Verebes as Jan, another student, and there are the scene stealers Hans Junkermann, Kurt Vespermann and Hermann Picha as the authorities. Walter Reisch wrote the screenplay for Der Bettelstudent/The Beggar Student (Jacob Fleck, Luise Fleck, 1927). He gave another direction to the story of the operetta by Carl Millöcker. As in the original, the film is situated in Krakow, 1704. Poland is under the rule of the unpopular Saxon king, August II. Two poor, revolting students Simon and Jan have been jailed by Colonel Ollendorf. But they can trick the officer and conquer the hearts of the two daughters of Countess Palmatica Nowalska. But at the end of this cheerful film version, even Colonel Ollendorf does not remain empty-handed. Author Reisch gave Ollendorf the countess as a wife. Carl Millöcker's operetta with a libretto by F. Zell and Richard Genée was premiered at the Theater an der Wien in Vienna, on 6 December 1882. It was an immense success. In Berlin, the Friedrich-Wilhelmstädtisches Theater’s production proved a sensation, racing past its 200th performance in seven months and in Hungary the reception won by A koldusdiák was equally as violent. The operetta was one of the triumphs of the European musical theatre of its era, and was played regularly throughout Europe and the US for many years. There have been nearly 5,000 productions since 1882. The operetta has been filmed at least six times. 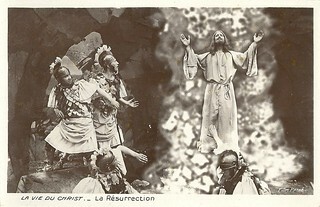 The first adaptation, a silent 1922 film by Hans Steinhoff is considered lost. Der Bettelstudent (1927) by the husband and wife team of Jacob & Luise Fleck was the second silent version. In 1931, sound adaptations in both an English and a German version followed, The Beggar Student (Victor Hanbury, John Harvel, 1931) and Der Bettelstudent (Victor Janson, 1931). In the latter starred Hans Heinz Bollmann, Jarmila Novotná, and Truus van Aalten. Two other German sound versions later followed, Der Bettelstudent (Georg Jacoby, 1936) with Johannes Heesters and Marika Rökk, and Der Bettelstudent (Werner Jacobs, 1956) starring Gerhard Riedmann and Waltraut Haas. The most recent The Beggar Student to come to the screen did so in Hungary in 1977, directed by László Seregi. 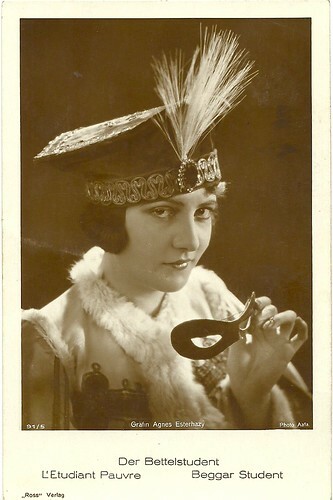 Local operetta star Marika Németh played Countess Palmatica. 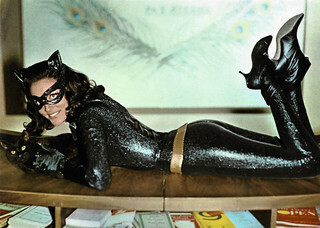 It has also been adapted for German television, and the operetta continues to be performed on stage. German postcard by Ross Verlag, Berlin, no. 91/3. Photo: Aafa. 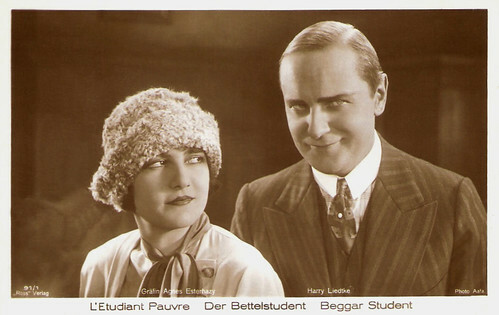 Publicity still for Der Bettelstudent/The Beggar Student (Jacob Fleck, Luise Fleck, 1927) with Agnes Esterhazy and Harry Liedtke. German postcard by Ross Verlag, no. 91/4. Photo: Aafa Film. 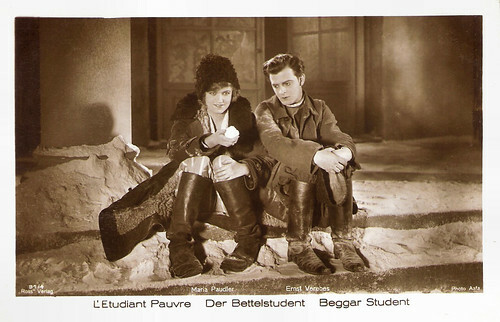 Publicity still for Der Bettelstudent/The Beggar Student (Jacob Fleck, Luise Fleck, 1927) with Maria Paudler and Ernö (or Ernst) Verebes. German postcard by Ross Verlag, Berlin, no. 91/5. Photo: Aafa. Publicity still for Der Bettelstudent/The Beggar Student (Jacob Fleck, Luise Fleck, 1927) with Agnes Esterhazy. Collection: Didier Hanson. Sources: Kurt Gänzl (Operetta Research Center), Wikipedia (German and English), and IMDb.